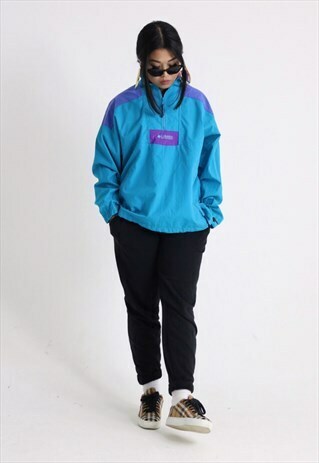 Vintage COLUMBIA Sports Windbreaker Jacket . CONDITION: This item is a vintage/pre-worn piece so some signs of natural wear and age are to be expected. Some stain spots on front of garment - please see pics. However good general condition . SIZE: M . Actual Measurements Jacket: Neck to Hem: 27" . Pit to Pit: 24". Our model T is about 5ft1 and usually wears a size UK 10 . SHIPPING: Free UK standard shipping. CONNECT: Remember to tag us in your instagram post featuring our item, for a feature and 10% off your next purchase.